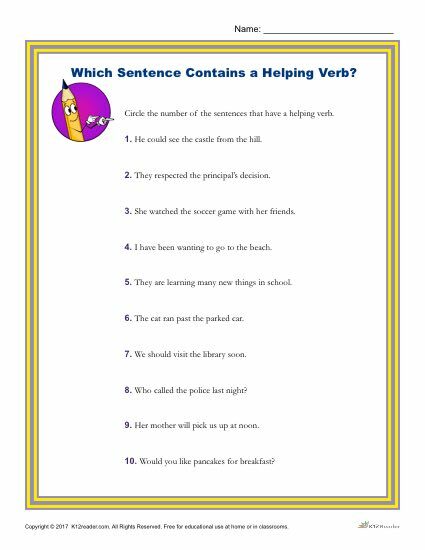 Which sentence contains a helping verb? What is a helping verb? A helping verb, sometimes called auxiliary verbs, helps out the main verb in a sentence. They accomplish this by giving more detail to how time is portrayed in a sentence. In this printable sentence structure worksheet, students will focus on helping verbs. Students will be instructed to read through the given sentences and circle the number of each sentence that contains a helping verb. This activity is ideal for 3rd – 4th grade, but can be used where appropriate. It is great practice for use at home or in the classroom by parents, teachers, and students. Click the link below to download and print the PDF to get started.